The tech stock now yields an astonishing 4.5%. A combination of a rising dividend and unrelenting pessimism has turned International Business Machines (NYSE:IBM) into a dividend investor's dream. A recent dip has pushed the stock close to its 52-week low, just about two months after the company raised its dividend for the 23rd consecutive year. The result is a 4.5% dividend yield, the highest yield for IBM in more than two decades. As far as large technology companies go, IBM now tops the list in terms of dividend yield. Dividend yield based on most recently announced payment. Data source: Morningstar. IBM's sky-high dividend yield isn't due to big dividend increases. The latest dividend bump in April increased the quarterly payout by just 4.7%. 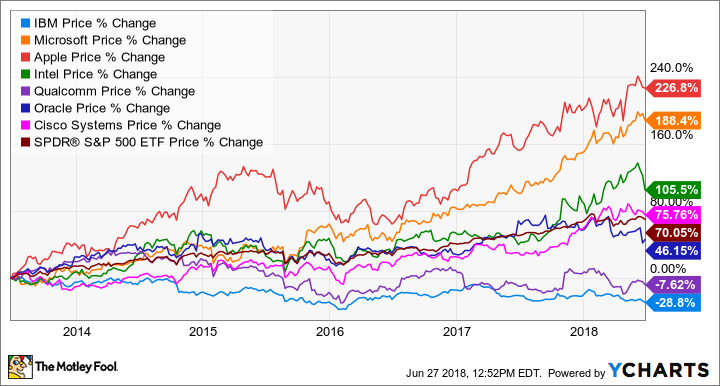 Instead, the underperformance of IBM's stock over the past few years has been the main driver. Why is IBM stock down so much? In short, six years of slumping revenue have taken their toll. IBM's top line peaked in 2011, declining each year through 2017. The company has been working to transform itself, investing in cloud computing and artificial intelligence while shifting resources away from some of its legacy businesses. The newer parts of IBM are doing just fine: The growth businesses grew by 11% in 2017, accounting for 46% of the company's total revenue. But weakness in other businesses has offset that growth. This decline occurred against the backdrop of incredible growth in the cloud computing market. Amazon has grown its cloud computing business into a behemoth, with more than $17 billion of revenue last year. Microsoft is following suit with its Azure cloud platform, which is still nearly doubling revenue on a year-over-year basis. IBM's own cloud business is growing nicely, up 24% last year to $17 billion. But the company is more geared toward serving enterprise customers, focusing more heavily on hybrid and private clouds. Without Amazon- or Microsoft-like growth numbers, and without a heavy focus on the public cloud, IBM's cloud growth story just doesn't seem to be resonating with investors. The good news is that IBM is growing again, thanks in part to currency shifting from a headwind to a tailwind. If IBM can put together a string of solid quarters, the market may finally start to come around. Not only does IBM sport an extremely high dividend yield, but the stock trades for peanuts. Based on the company's guidance for adjusted earnings, shares of IBM currently go for just about 10 times earnings. The market is pricing IBM like it will never grow again. That seems overly pessimistic to me. IBM's biggest advantage is its base of large, longtime customers. That's the reason why the company has managed to continually generate more than $12 billion of free cash flow each year throughout its transformation, despite steep drops in revenue. The fact that companies and industries rely on IBM's products and services buys the company time to adapt. That's exactly what it's doing. IBM is targeting low single-digit revenue growth and high single-digit earnings-per-share growth in the long run, which doesn't sound very impressive. And it wouldn't be if IBM were trading in line with its tech peers. This is a stock, however, that's been left for dead. All IBM really needs to do is prove to investors that it's not permanently in decline. I think IBM will be just fine. That's why I own the stock. And I'm happy to be paid 4.5% in exchange for my patience.